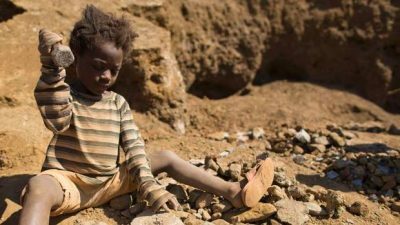 Major electronics brands, including Apple, Samsung, Sony, Microsoft and Vodafone are failing to do basic checks to ensure that cobalt mined by child labourers has not been used in their products, said Amnesty International and Afrewatch in a major new report published last week. The report, ‘This is what we die for: Human Rights Abuses in the Democratic Republic of the Congo Power the Global Trade in Cobalt‘, traces the sale of cobalt, used in lithium-ion batteries, from mines where children, some as young as seven, and adults work in perilous conditions. 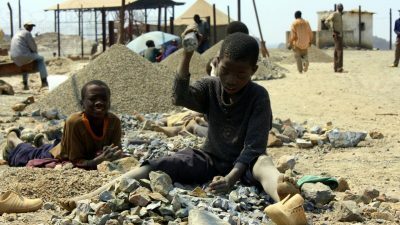 Coming just a day ahead of the World Economic Forum in Davos, the report documents how traders buy cobalt from areas where child labour is rife and sell it to Congo Dongfang Mining (CDM), one of the largest mineral processors in the DRC and a wholly-owned subsidiary of Chinese mineral giant Zhejiang Huayou Cobalt Ltd (Huayou Cobalt). Huayou Cobalt gets more than 40% of its cobalt from the DRC. Amnesty’s investigation uses investor documents to show how Huayou Cobalt and CDM process the cobalt before selling it to three battery component manufacturers in China and South Korea. In turn, they sell to battery makers who claim to supply technology and car companies, including Apple, Microsoft, Samsung, Sony, Daimler and Volkswagen. “The glamorous shop displays and marketing of state-of-the-art technologies are a stark contrast to the children carrying bags of rocks, and miners in narrow man-made tunnels risking permanent lung damage. Amnesty contacted 16 multinationals listed as customers of the battery manufacturers that source processed ore from Huayou Cobalt. One company admitted the connection, while four were unable to say for certain whether they were buying cobalt from the DRC or Huayou Cobalt. Six said they were investigating the claims. Five denied sourcing cobalt from via Huayou Cobalt, though they are listed as customers in company documents. Two multinationals denied sourcing cobalt from the DRC. “It is a major paradox of the digital era that some of the world’s richest, most innovative companies are able to market incredibly sophisticated devices without being required to show where they source raw materials for their components. Miners working in areas from which CDM buys cobalt risk long-term health damage and fatal accidents. At least 80 artisanal miners died underground in southern DRC between September 2014 and December 2015 alone. The true figure is unknown, as many accidents go unrecorded and bodies are left buried in the rubble. Amnesty researchers also found that the vast majority of miners spend long hours every day working with cobalt without the most basic of protective equipment, such as gloves, work clothes or face masks to protect them from lung or skin disease. Children told Amnesty researchers that they worked for up to 12 hours a day in the mines, carrying heavy loads, to earn between one and two dollars a day. In 2014 approximately 40,000 children worked in mines across southern DRC, many of them mining cobalt, according to UNICEF. “The dangers to health and safety make mining one of the worst forms of child labour. Companies whose global profits total $125 billion cannot credibly claim that they are unable to check where key minerals in their productions come from. 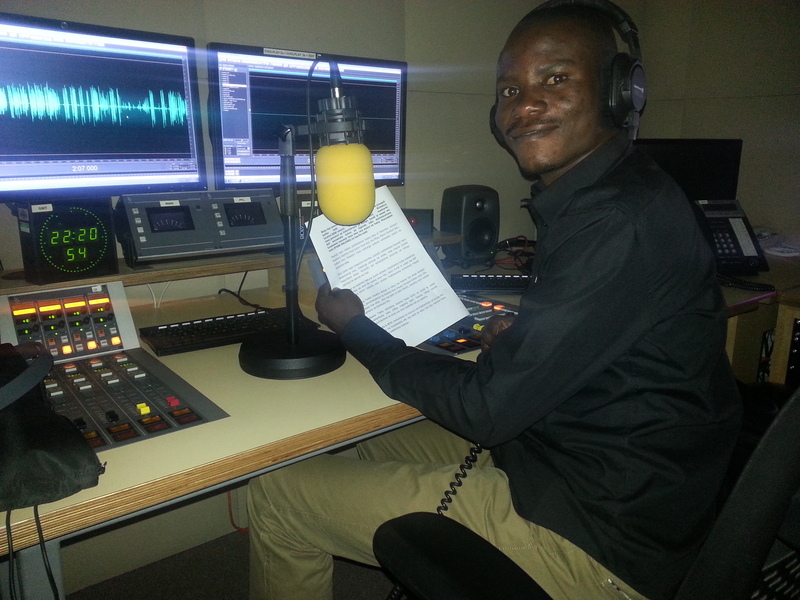 Amnesty and Afrewatch researchers spoke to 87 current and former cobalt miners – 17 of them children – from five mine sites in southern DRC in April and May 2015. They also interviewed 18 cobalt traders and followed vehicles of miners and traders as they carried cobalt ore from mines to markets where larger companies buy the ore. The largest of them is Huayou Cobalt’s Congolese subsidiary CDM. Huayou Cobalt supplies cobalt to three lithium-ion battery component manufacturers Ningbo Shanshan and Tianjin Bamo from China, and L&F Materials from South Korea. These three battery component manufacturers bought more than US$90 million worth of cobalt from Huayou Cobalt in 2013. Amnesty then contacted 16 multinational consumer brands listed as direct or indirect customers of the three battery component manufacturers. None said they had been in touch with Huayou Cobalt or traced where the cobalt in their products had come from prior to Amnesty’s contact. “Many of these multinationals say they have a zero tolerance policy for child labour. But this promise is not worth the paper it is written on when the companies are not investigating their suppliers. Their claim is simply not credible. “Without laws that require companies to check and publicly disclose information about where they source minerals and their suppliers, companies can continue to benefit from human rights abuses. Governments must put an end to this lack of transparency, which allows companies to profit from misery. Amnesty and Afrewatch are calling on multinational companies who use lithium-ion batteries in their products to conduct human rights due diligence, investigate whether the cobalt is extracted under hazardous conditions or with child labour, and be more transparent about their suppliers. The organisations are also calling on China to require Chinese extractive companies operating overseas to investigate their supply chains and address human rights abuses in their operations. The organisations say Huayou Cobalt should confirm who is involved in mining and trading its cobalt (and where) and make sure it is not buying cobalt mined by child labour or in dangerous conditions.